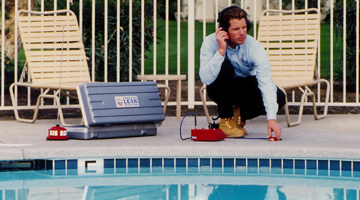 A trained leak detection specialist will be out to your Sacramento Swimming pool in just moments from your call to us. It is a common occurrence for Sacramento Swimming Pools to lose between 1/8″ and 1/4″ of water per day due to evaporation, a greater loss indicates a Swimming Pool Leak problem. If your Swimming Pool is experiencing a suspected problem, then please give us a call so we can schedule a Leak Detection Service. Remember that prolonged leaks will turn from an inexpensive fix, to an expensive excavation. Often Swimming Pool Leaks can result from defects in the pool shell or any of the plumbing associated with recirculating, filtration, and spa systems. Our job is to evaluate your situation and seal up any leaks that may be occurring. The extra demand for makeup water and chemicals is not only a costly nuisance to maintain, which diminishes your enjoyment, but some leaks can actually damage the integrity of your pool’s structure and threaten your investment. Our pool leak technicians use specialized equipment, tests, and techniques proven most effective in diagnosing and locating any type of pool leak. Their training, experience, and thorough knowledge of pool construction and operation assure efficient, accurate diagnosis. Furthermore, as a licensed pool contractor, Dynamic Services is qualified to make the necessary repairs once the problem has been identified. Losing an abnormal amount of water in your swimming pool? It very well may be either a leak or a minor equipment adjustment. Instead of wasting time and money (water), know this: An average leak can cost homeowners $423-900+ / yr. Even a one-time service call is very inexpensive (often $85), which we can help you decide if your assumptions are correct or not.